With that dismal number, the President proposes a 25% increase in minimum salary to $9/hr. The result? The least educated, experienced and skilled will be priced out of the market. A higher minimum wage will hurt Obama’s most loyal supporters. The damage from a minimum wage hike depends on the overall labor market. If the job market is buoyant, as it is in the fracking boomtown of Williston, N.D., fast-food workers may already make more than $9 an hour. But when the jobless rate is high, as it still is in California and New York, the increase punishes minority youth in particular. That is what happened during the last series of wage hikes to $7.25 from $5.15 that started in July 2007 as the economy was headed toward recession. 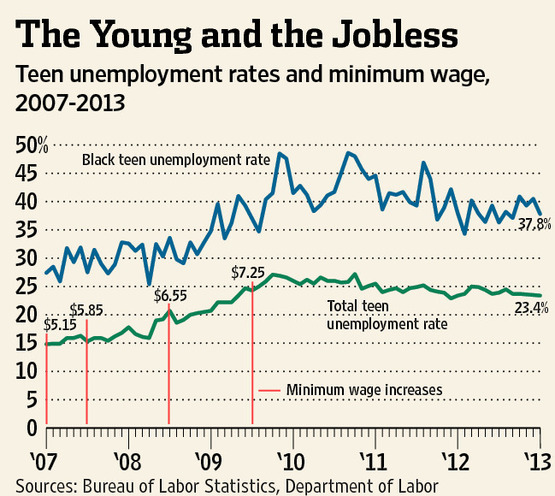 The last increase hit in July 2009 just after the recession ended, and as the nearby chart shows, the jobless rate jumped for teens and black teens especially. For black teens, the rate has remained close to 40% and was still 37.8% in January. William Dunkelberg, chief economist for the National Federation of Independent Business, says that after the July 2009 increase 600,000 teen jobs disappeared in the next six months even as GDP expanded. In the previous six months, when the economy was still shrinking, half as many teen jobs were lost. The overall teen jobless rate was still 23.4% last month, which means demand for unskilled workers is low even at $7.25 an hour. Demand will be lower at $9. But today, a full-time worker making the minimum wage earns $14,500 a year. Even with the tax relief we’ve put in place, a family with two kids that earns the minimum wage still lives below the poverty line. That’s wrong. He left out that most minimum-wage earners are not the primary bread winner. Nearly 40% live with a parent or relative. The average family income of a household with a minimum-wage worker is about $47,023—which is far above the poverty line of $23,550 for a family of four. Mr. Obama didn’t even tell the whole story about parents raising a family on a minimum-wage income. A full-time minimum-wage worker earns roughly $15,000 a year. But that worker also receives a cash supplement from the earned income tax credit of roughly $5,000, and many states provide benefits on top of that to reward working. That doesn’t count government benefits like food stamps, Medicaid, child care and more. According to data from the Employment Policies Institute, about two of every three minimum-wage workers also get a raise within one year. relaxing with friends he did not identify. Mrs. Obama’s office did not respond to a question about her plans for the weekend. On the night of 9-11, after the US Embassy in Cairo was stormed, and after hearing that the US Consulate in Benghazi was under attack, Barack Obama did nothing. After being briefed by his top security advisers at a pre-planned meeting in the White House around 5:30 PM EST, he never picked up the phone again to see how things were going. And four innocent Americans including the US ambassador to Libya, were slaughtered. 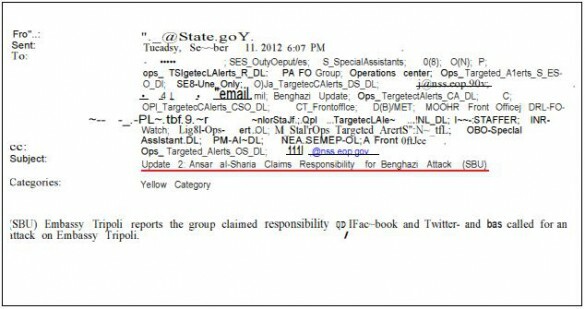 This email was sent to State Department officials, White House officials, Secret Service officials at 6:07 PM EST on 9-11, from Benghazi officials the night of the terrorist attack. The email clearly blamed Al-Qaeda linked group Ansar al-Sharia for the attack on the US consulate. This was before the lifeless body of Ambassador Stevens was dragged from the consulate ruins. This was at least the third email sent to the White House on 9-11 from Benghazi. everybody in NJ wants to be a Senator. Why Should I Care About the U.S. Debt? No biological clock for men: Cary Grant was a first-time dad at age 65, and now Steve Martin’s a first-time dad at 67. Why Was an Iranian Official Found with Millions in Venezuelan Money? Meteorite Strikes Central Russia, Up To 500 Injured, not to be confused with the asteroid heading our way today. You learn something new every day: Penises are called chubbies.